During my recent short stint (only 7 days) in the Philippines, I have experienced once again the heavy rain showers of Manila. There were no typhoons, just run-of-the-mill soaking monsoon rains of the tropics. In one instance while I was there, the heavy rains have caused flooding in Metro Manila that traffic crawled to a halt. I even heard in the evening news that my alma mater, University of Santo Tomas, was forced to close the school due to high floods in España. This brought a flood of memories as well, of my wading days in “water world” of Manila. Our family have also experienced another type of rain. Rain that just not soak us wet but can bring us down to our knees. Yet these rains if we survive them, can make us strong. I went home because my mother was not doing well. At one point she was even knocking on heaven’s doors. I spent most of my stay in the Philippines inside the hospital, University of the East Ramon Magsaysay (UERM), where my mother was admitted. In fact, I slept a couple of nights in the hospital not as a doctor-on-call, but as a “bantay” or watcher of a patient. My mother must have appreciated that she have me as her bantay, not because I am a doctor, and an ICU specialist at that, but more so, that I was there as her son. The system in the Philippines is kind of different that all patients have a family member, as a watcher, to attend to the patient’s need while they are in the hospital. In the US, rarely any patient have a watcher. They have a call light to summon the nurse if they need something. That’s it. No wonder, patients feel all alone. One day while I was the watcher in the hospital, I went out to SM Santa Mesa mall, which was a couple of blocks away from UERM, to get lunch, as I was getting tired of the food from the hospital cafeteria. I have nothing against hospital food though. Then it rained. Heavy downpour. I got stranded at a waiting shed near SM during the rainfall. Of course I did not bring an umbrella. I think an umbrela will be useless in that heavy downpour anyway. I was waiting for the rain to lighten up. But as I looked up in the sky it was getting even darker, and I may be waiting there for a long, long time. I knew I needed to get back to the hospital. So I decided to run in the rain in full abandon. I got wet. Though not really drenched. But to me the rain was refreshing as it cooled me off and washed away some of the afternoon heat. It also helped clear my mind and realize what my real priorities in life were. Not getting wet was not one of them. Besides, why are we afraid to get soaked from the rain anyway? We may prefer eternal blue skies and beautiful summer days. We don’t like the rain to spoil our fun. We don’t like the rain to wet our beautiful outfit. We don’t like the rain to ruin our perfect plans. Yet, rain and clouds are part of our lives. I don’t mean just the weather. I am back in Iowa now. And we are also getting unseasonable lots of rain here. We have plenty of rain that the grass here are still so green even if it’s almost end of summer. Usually by this time of year here, the grass has started to turn brown. But I’m not complaining. This morning, I finally came out to run after fighting jet-lag for several days. I was trying to put back on track my training for the half marathon which is not too long from now, since my training was temporarily derailed by my emergent and unscheduled trip to the Philippines. As I came out, the road was wet from the heavy rain last night. I have noticed thousands of earthworms scattered in the paved road. 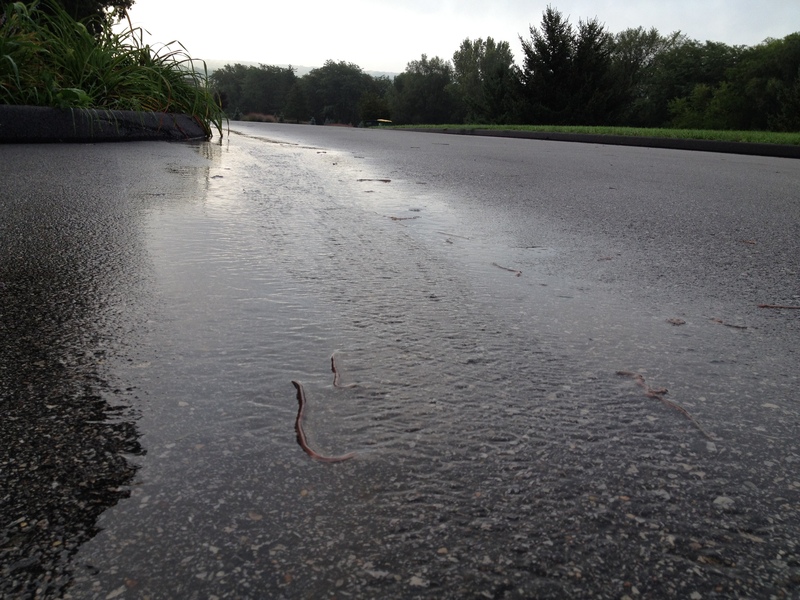 Why earthworms go out after the rain is not really clear. Some experts say the rain drive them out of their burrows so they will not drown, while other experts refute this, as earthworms don’t drown, and they can live totally submerged in water for few days. In any case, these earthworms who are now on the road, will die and will get baked in the heat of the sun, unless they get back to the soil in time. Are they afraid to get soaked from the rain too? But trying to run away from getting soaked put them more in harm’s way. While I was running, the dark rain clouds gathered around above me again, taunting to pour down its contents. I’m not an earthworm. And I’m not afraid of the rain anymore.